You are here: Home / News / Cheese / Get Your Grilled Cheese On! All of Wisconsin is celebrating a cheesy favorite this month: The Grilled Cheese Sandwich. We’re getting in on the action ourselves by featuring one of our favorite grilled cheese cheeses… our Blaser’s Bacon Muenster (we had you at bacon, didn’t we?). When it comes to the grilled cheese sandwich, you want it creamy and gooey. Our Blaser’s Muenster doesn’t disappoint. We tell you all about it here. While a grilled cheese sandwich may seem like a pretty simple creation; there’s actually more to it than one would think. The Grilled Cheese Academy offers these tips for making a professional (and delicious) grilled cheese that will make your taste buds very happy! TO SLICE OR NOT TO SLICE: Often it’s best to grate or shred the cheese. This promotes faster melting, as well as a smooth and more even melt. Of course, if a recipe calls for sliced cheese, go ahead and use sliced cheese. SLICING AND MELTING: It’s easier to slice and grate cheese when it’s cold. So what should you do? That’s right, slice and grate the cheese when it’s cold. Furthermore, cheese melts best when brought to room temperature. So what should you do? Correct! Melt the cheese after it’s brought to room temperature. Now you’re getting this. MORE IS BETTER: Don’t be shy. Pile on the cheese. There you go! Now pile on more. Also, expand your horizons by using several types of cheese at once, as well as unique toppings. Remember, Cheddar and American aren’t the only game in town. USE THE REAL DEAL: Margarine and other butter wannabes win you no points. So only use real butter. When it comes to flavor and creating the ultimate golden toast for your sandwich, nothing compares to the real thing. SOFT IS GOOD: Soft butter rules supreme. Not only does it spread easily, but it also browns the bread more evenly. Simply put, always bring butter to room temperature before commencing grilling. USE YOUR IMAGINATION: White bread is not always the answer. Be creative. Use unique breads to create equally unique grilled cheese sandwiches. SIZE MATTERS: Always use the right size skillet or pay the consequences. If you opt for a skillet that’s too small, your sandwich will cook too slowly and not evenly. Not good. FLIP, PRESS, REPEAT: You want the cheese to spread evenly as it melts. So always press the sandwich with a spatula after you flip it. Forgetting to do so is a telltale sign of a novice. Obviously, open-faced grilled cheese sandwiches do not require flipping. CAST OFF CAST IRON: Cast-iron pans and grilled cheese sandwiches are not friends. Always use a nonstick pan to minimize “stickage” (yes, we made up that word). Using a nonstick pan also makes cleanup easier. LOW AND STEADY: Be patient. Don’t grill over high heat. Not only will the bread brown too fast, but the cheese will not melt completely. Always grill over low heat. Once you’ve mastered these techniques, it’s time to get creative. 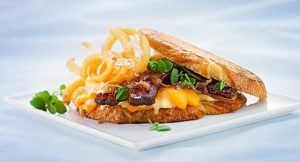 The Grilled Cheese Academy and Wisconsin Milk Marketing Board are sponsoring their 4th Annual Grilled Cheese Recipe Showdown! Be forewarned, these aren’t your Grandma’s grilled cheese sandwiches. We’re talking culinary artistry at its finest! But with cash awards totaling over $30,000, this is one contest you’re going to want to check out. Come on… “muenster” the courage and creativity (< — Ha, did you see what we did there) to come up with a spectacular sandwich that’s uniquely your own. Maybe your special grilled cheese recipe will be the big winner! See the contest details here, or pick up an entry form at our Ellsworth retail store.